original creator had, so I emailed her and asked how she did it. followed her process in the video, and oh boy, what a difference! 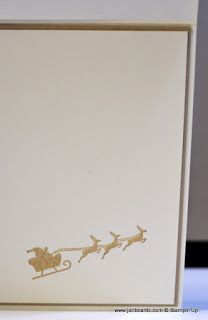 stamping and heat embossing before she did her sponging. Bird Stamp Set, which I don’t have, so I had to find an alternative. Vanilla, although I think it looks alright, I wouldn’t choose it again. remind myself of the process I had to follow. in a light colour; I think it looks great with Very Vanilla. bring myself to put the third smoke spiral on a house without a chimney! without making my card looking untidy! with some Silver Metallic Thread. 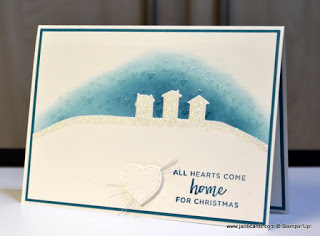 Thanks for sharing this idea Rebecca – I love it! That’s it for today. I hope you enjoy the video. Until tomorrow, happy crafting. 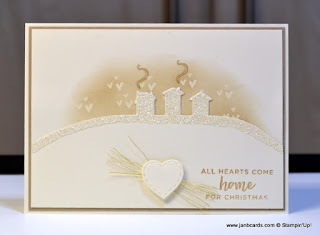 What a sweet card, Jan! Love the idea of it "snowing" hearts (or raining, I guess in your green version). 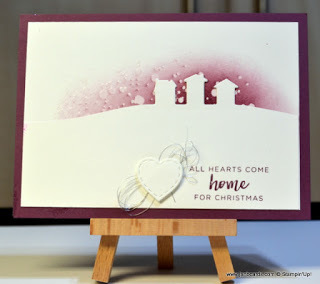 A person could also use the Gorgeous Grunge if they didn't have the others, the the hearts embossed behind the houses is so perfect for the sentiment at the bottom of the card. I'll be casing this one myself, so thank you for another super video tutorial!! Hi, Geraldine. 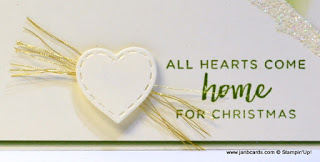 When I first cased Laura's card, I was looking for a stamp set with "splodges" as I don't have the Swirly Bird Stamp Set Laura had used, but as soon as I saw the hearts, I knew that'd be the one to use. Glad you enjoyed the video. ☺ Happy crafting, JanB.